He loves physics and raw asparagus. Or at least Ian did when I met him in 2012. I expect he still does. A year later I saw Ian again, at his family’s rural acreage south of Worthington. I remember how my friend Gretchen welcomed us with such enthusiasm, noting that she was thrilled to have dinner guests. My husband and I were happy to spend an evening with my blogger friend, her husband and their three children. They are a delight. Ian and his sisters toured us through the family’s 10-acre wooded and hilly creek-side property while their parents prepared dinner. Dad at the grill, Mom mixing salads. The kids clearly love their oasis in the middle of southwestern Minnesota’s prairie farmland. These are a talented group of siblings—into theatre and music and more—and just great kids who are friendly and kind and polite. As the evening ended and we prepared to leave, Gretchen and I simply had to have photos. I commanded a snapshot of myself standing with the sisters in the middle of the gravel road running past this family’s home. That put me with one foot in Minnesota and one foot in Iowa. Yes, they live on the border. 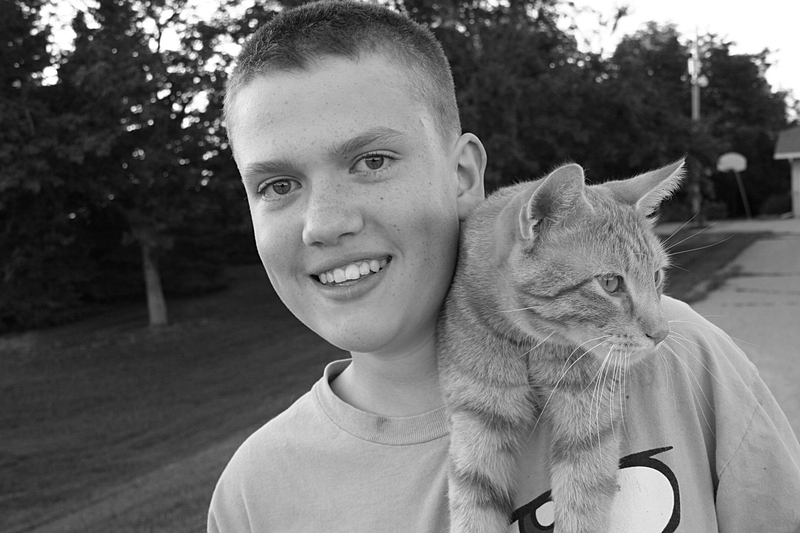 Ian wasn’t game for that shot, but the then 14-year-old did pose with the family cat, Zephyr. The lighting was perfect as was Ian’s pose. There’s something about this image that is sweet and timeless, that speaks to appreciating the moments of life, to simpler times, to the unencumbered spirit of youth. I expect, I mean know, that Ian is growing into a fine young man. 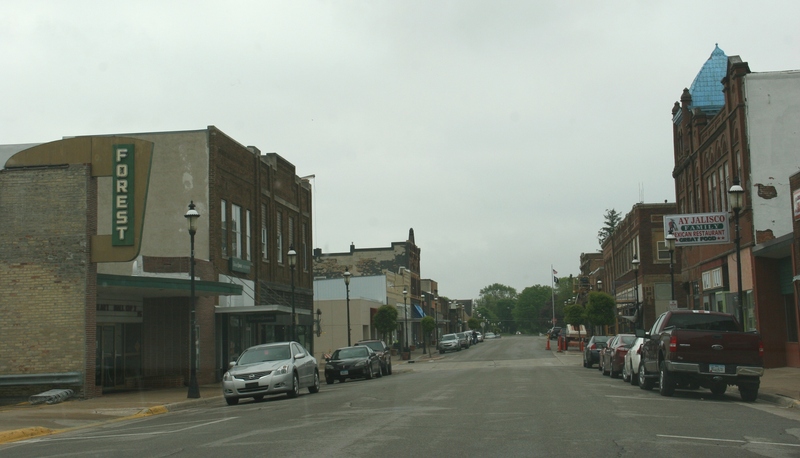 Downtown Forest City, Iowa, on a recent dreary Saturday. “YOU’RE REALLY NOT FROM HERE, are you?” Monte Topp surmised after telling me that Forest City is home to Winnebago Industries. I could feel the lack of recognition flicker across my face, prompting that comment from Monte, who lives just to the east in Fertile, Iowa. “No, I’m from Minnesota,” I said. And I’m not a camper, I thought, but didn’t speak. Still, I should have recognized Winnebago Industries as “the leading United States manufacturer of motorhomes and related products and services.” I’m certain the Winnebago Industries Visitors Center and Museum would have educated me, as would a tour of the manufacturing plant. But, since I wasn’t particularly interested, my husband and I didn’t stop while on a brief visit to Forest City. Another interesting name. 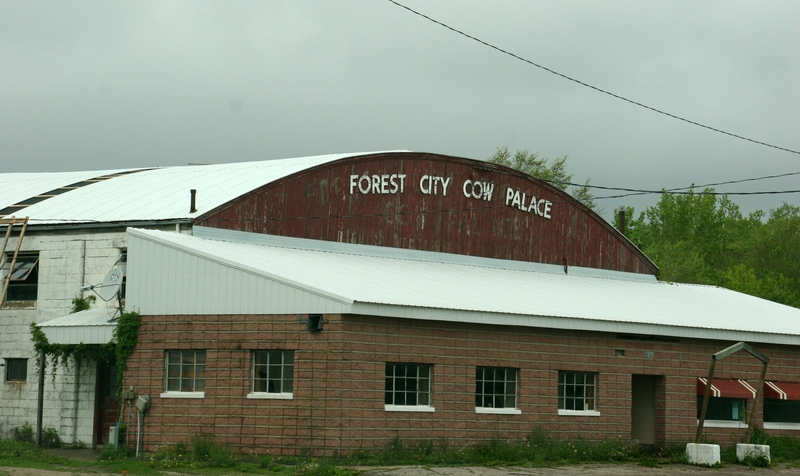 Forest City Cow Palace is apparently a livestock auction house. Monte might not be pleased with my lack of interest. But he laughed when I suggested his name, Monte Topp, sounded like that of a rock star. My first glimpse of Heritage Park of North Iowa, driving into Forest City from the south. He also mentioned that Forest City is home to a mega Winnebago campground. And besides Heritage Park of North Iowa where I met him, Monte suggested touring the Mansion Museum, which was closed when we were in town. 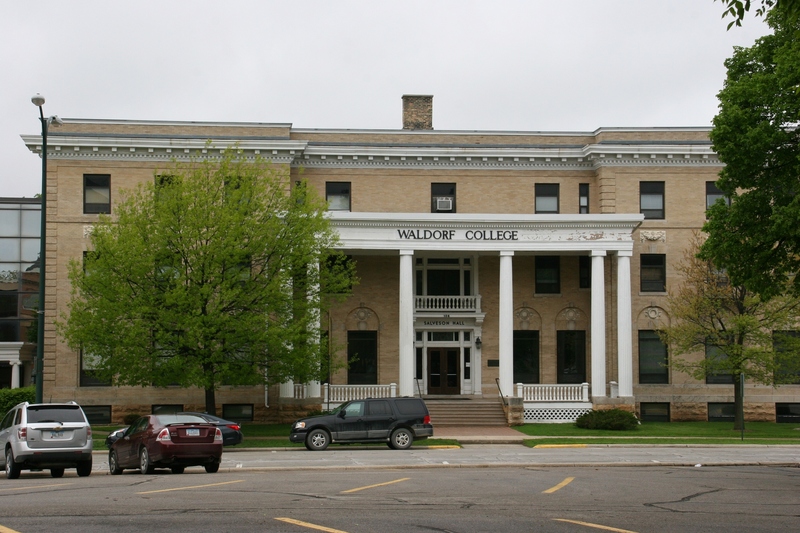 Waldorf College is located in Forest City with this building directly across the street from the Winnebago County Courthouse. What a stunning building, left, in the heart of downtown Forest City. It appeared abandoned and in need of repair. Just consider the potential for this architectural beauty. Yes, I should have done my homework in advance. But, as often happens with my regional travels, minimal planning is involved. It’s just drive and see what one discovers. And, no, I don’t have a smart phone or a laptop to instantly connect me to information while traveling. 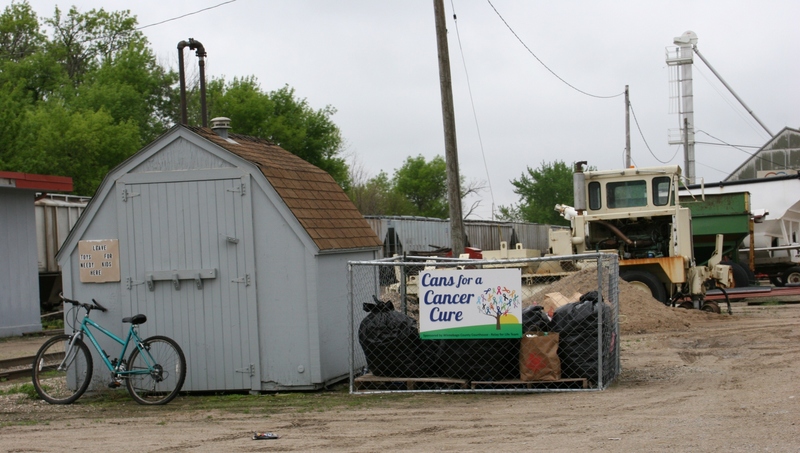 This collection site for cans for Relay for Life and for toys for needy kids shows me Forest City is a community that cares. 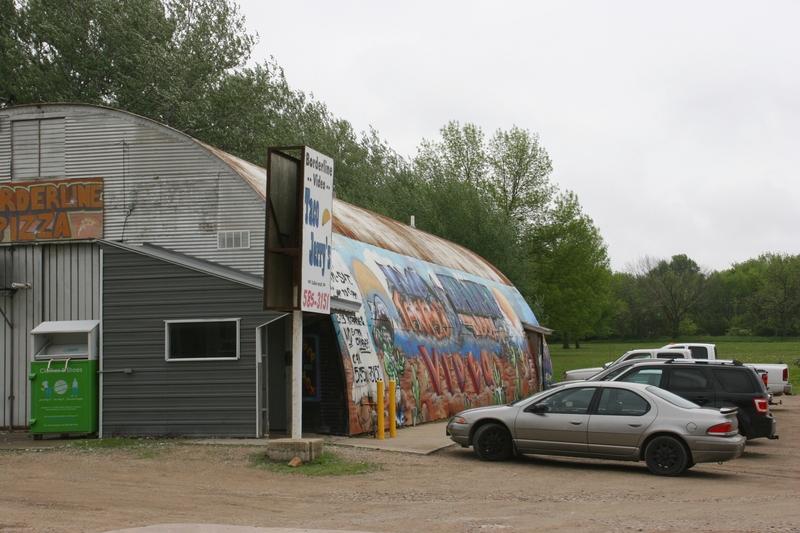 On the way out of town, I spotted this machine shed style building, home to Borderline Pizza & Video and Taco Jerry’s. 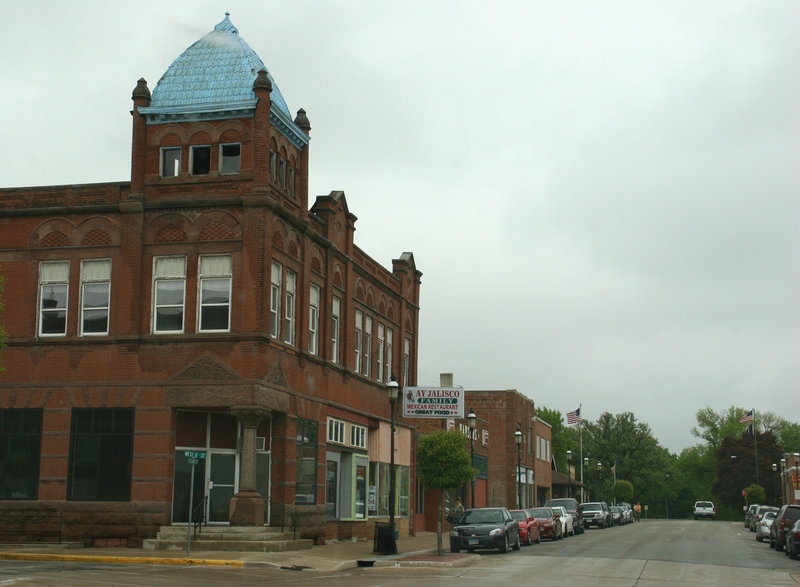 FYI: Click here, and then here and, finally, here to read my first three posts from Forest City, Iowa. 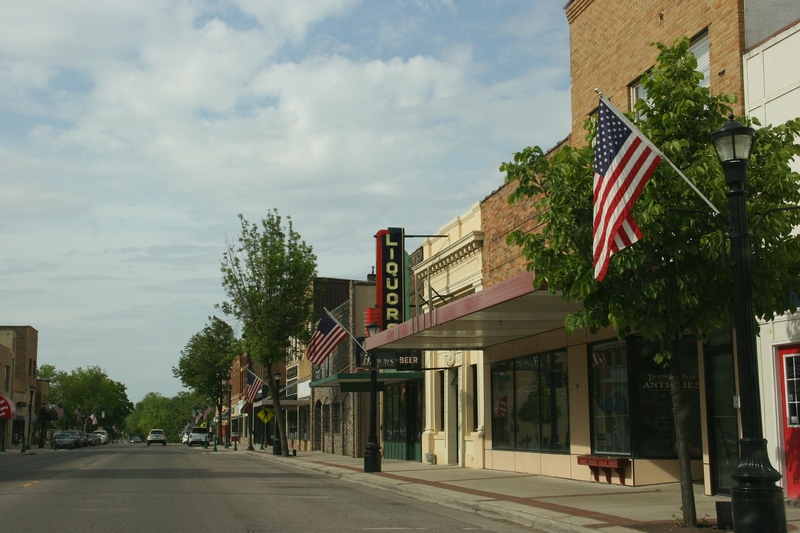 Check back next week as I begin a series of posts on a recent visit to Clear Lake, Iowa, to the south and east of Forest City. I’ll also take you to Lake Mills in a future post. 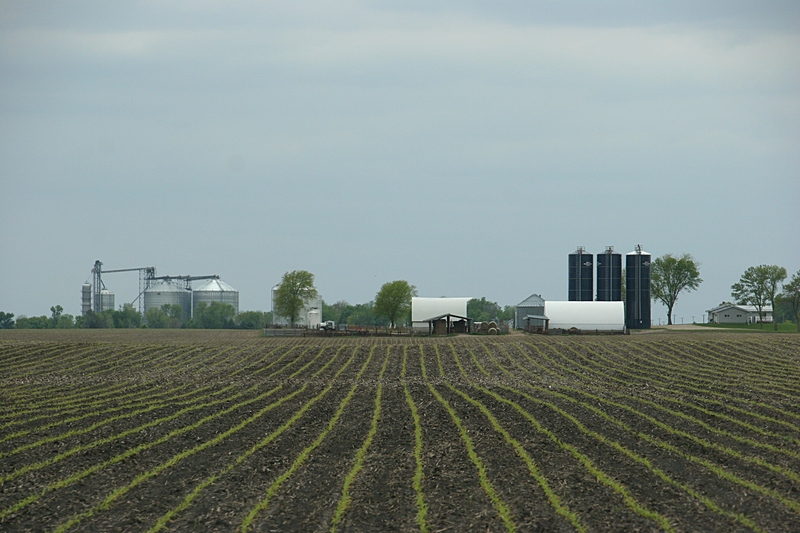 The greening of a farmsite between Faribault and Morristown. AUTUMN HAS ALWAYS been my favorite season here in Minnesota. But spring holds an appeal almost equally as strong. Corn rows emerge in a field near Delhi in southwestern Minnesota. We are in the throes of spring with trees now leafed out, dormant grass morphed to life and the black landscape of fields sprouting corn and soybeans, as if a farmer took a green pen and ruler and inked lines across the land. 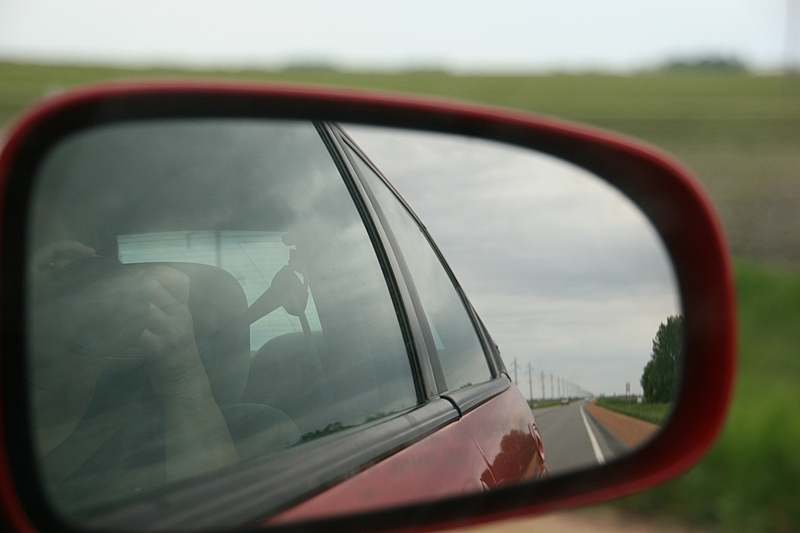 Minnesota State Highway 68 south of Morgan stretches out behind me in this snapshot taken of the passenger side mirror. Green breaks this monotonous stretch of roadway. 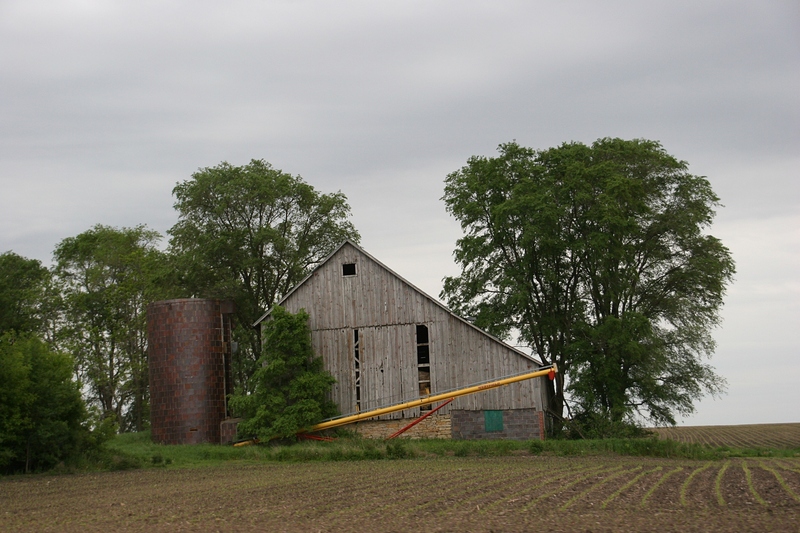 On a day trip to Belview and back to Faribault on Saturday, I delighted in the greenery of rural Minnesota. I find visual joy in viewing a landscape transformed. The intensity of green almost hurts your eyes. It’s that vivid. 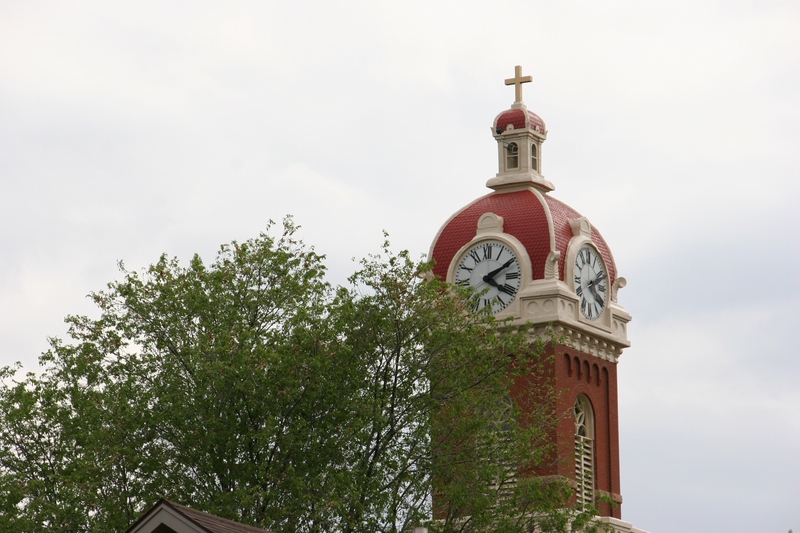 The steeple of the Cathedral of the Holy Trinity emerges from the canopy of trees in New Ulm. I treasure these late spring weeks, for I know this emerald gem is mine for only a sacred short time. TELL ME ABOUT the season in your part of the country or world. What do you see in the landscape that surrounds you? 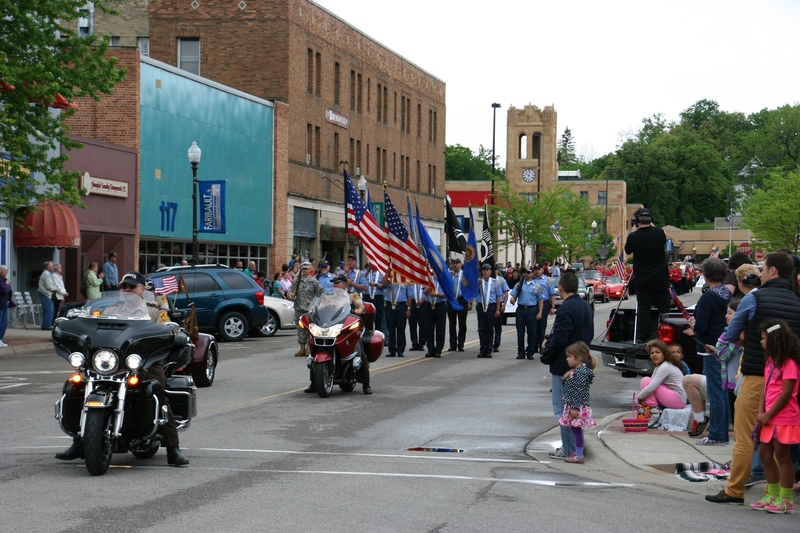 The parade begins with the Rice County Central Veterans Association Honor Guard/Color Guard leading the way. 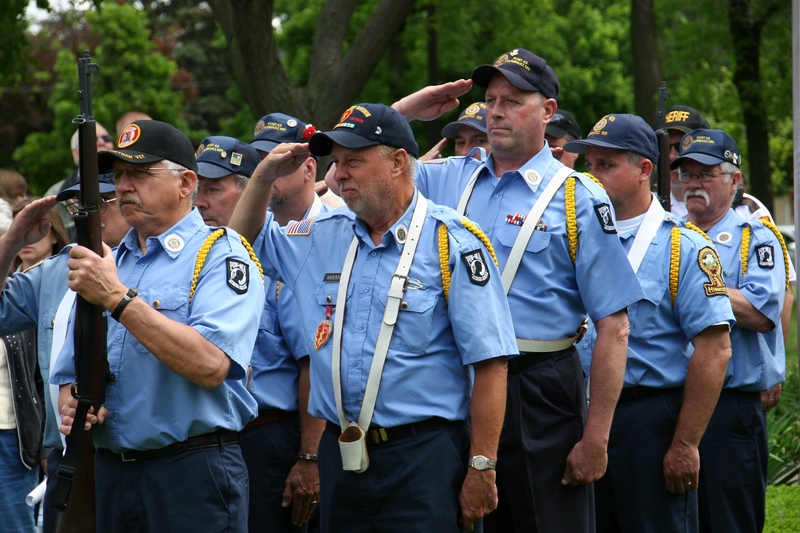 FOR THE THIRTY-THREE YEARS I’ve lived in Faribault, I’ve rarely missed a Memorial Day parade and the program that follows in Central Park. 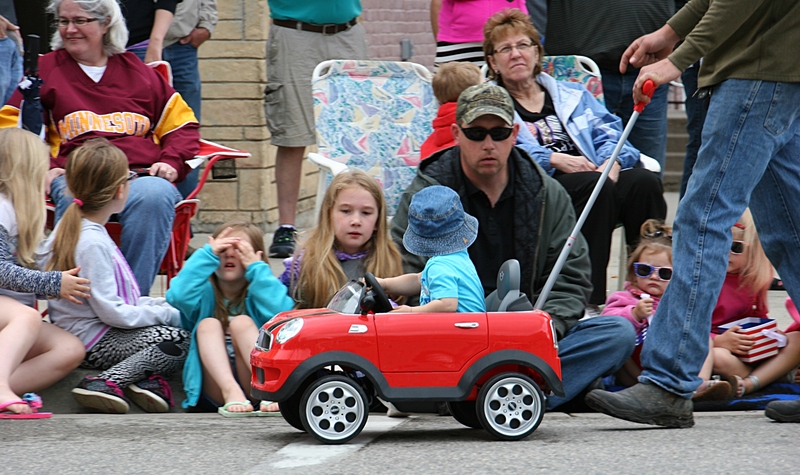 Little Ivan arrives for the parade in a car pushed by his dad, Jake. 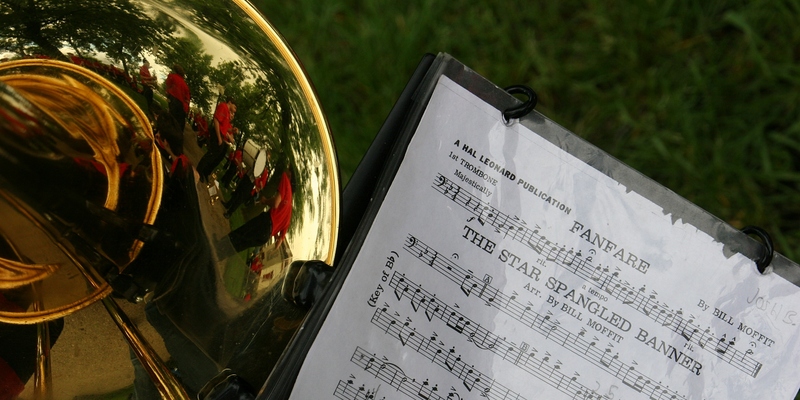 It’s a time-honored tradition of music and marches, salutes and speeches, flags and families. Saluting the flag at the ceremony in Central Park. 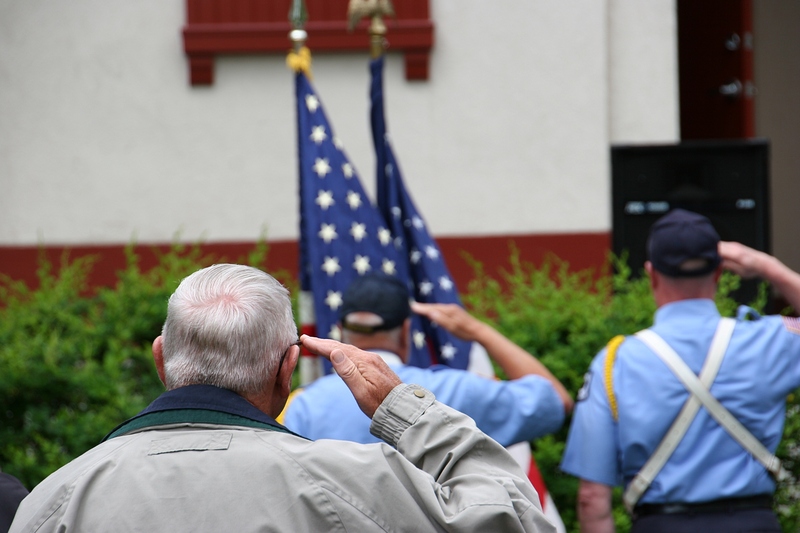 I’m proud to live in a community where patriotism and service to country and respect for the American flag and all it means runs strong from generation to generation. 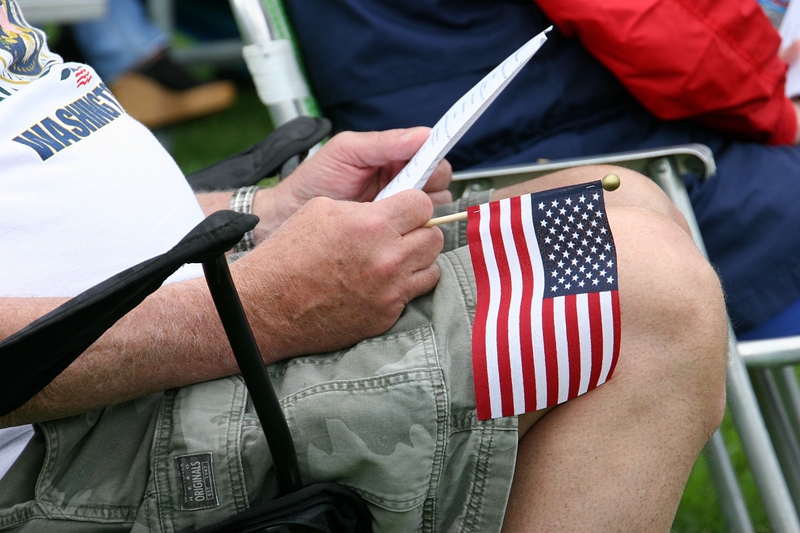 From kids to adults, many are dressed in a patriotic red, white and blue. 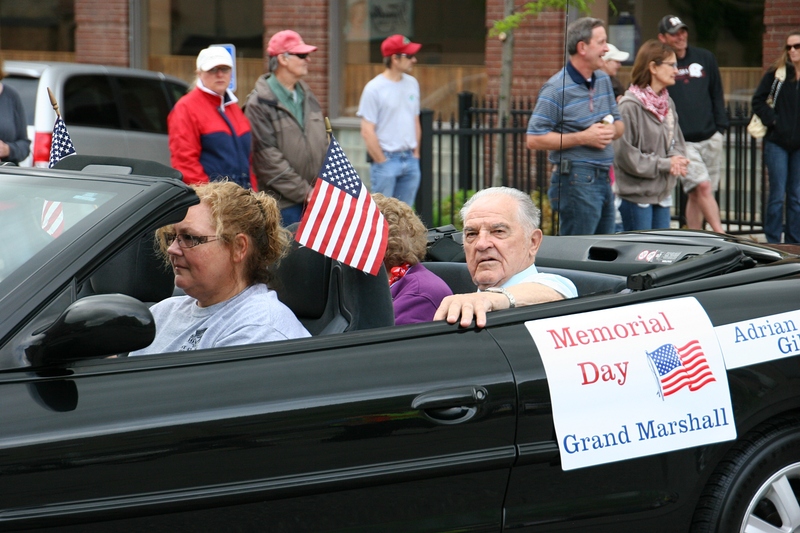 Grand Marshal, Adrian Gillen, rides in the parade alongside his wife, Jean. 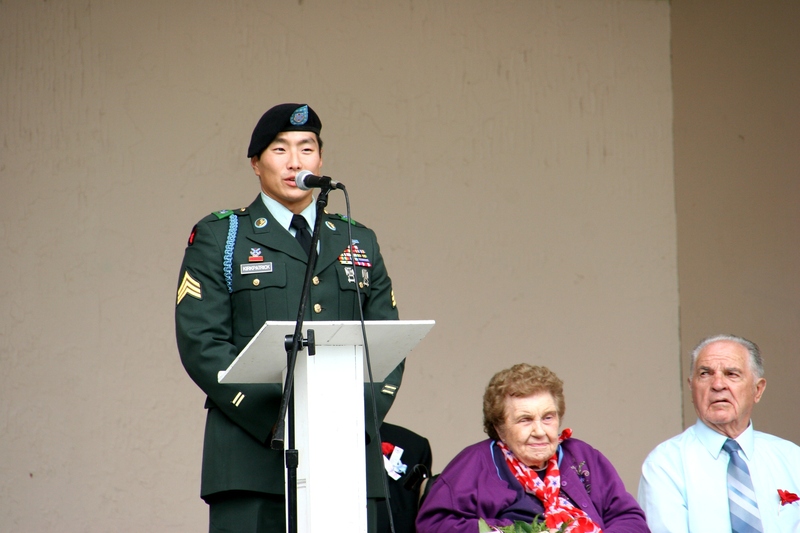 The couple both served their country and were duo grand marshals. 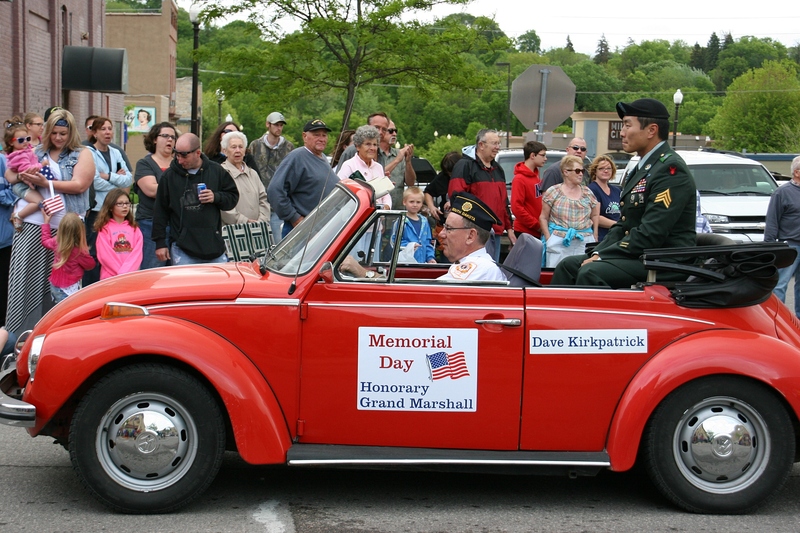 David Kirkpatrick, who is my eldest daughter’s classmate, was the honorary grand marshal. 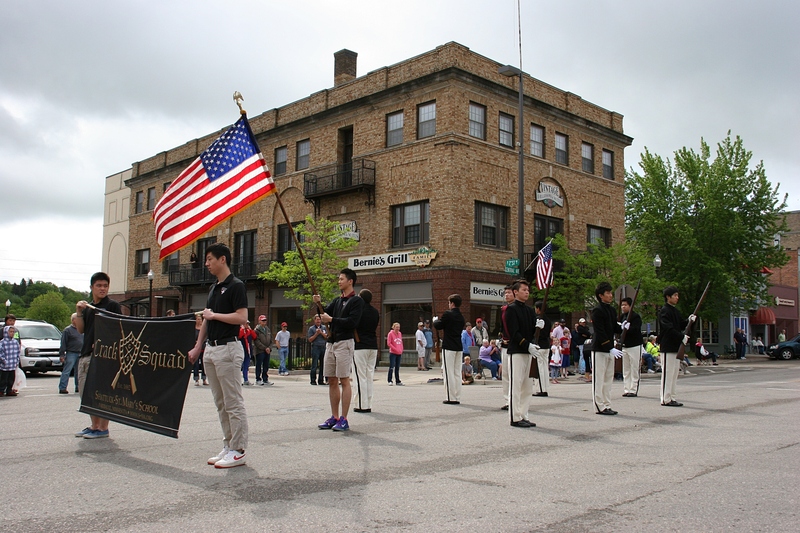 The Shattuck-St. Mary’s Crack Squad always marches in the parade and always fires their guns. 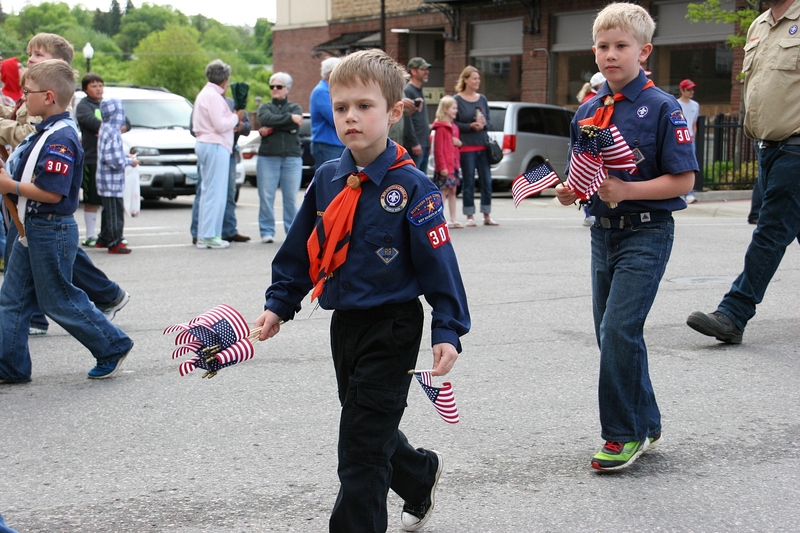 The Scouts always hand out American flags during the parade. 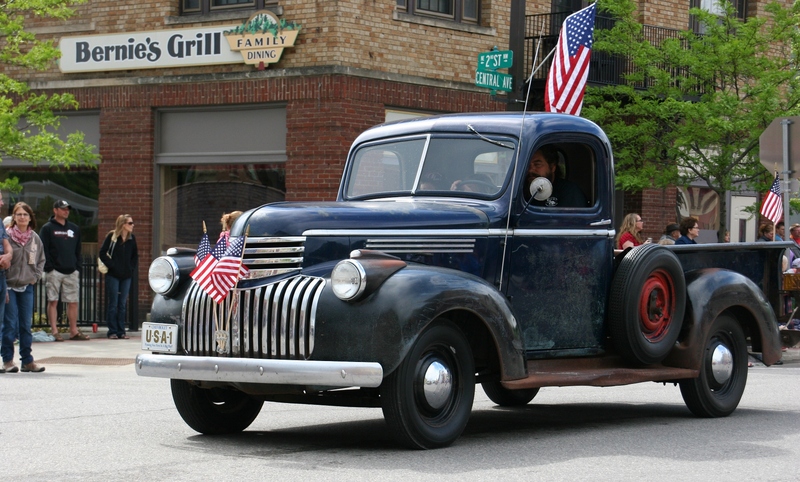 The parade includes vintage vehicles. You know the parade is ending when horses and riders arrive. At Central Park, the Bethlehem Academy Band awaits their turn to play the National Anthem. Some attendees clutch American flags. 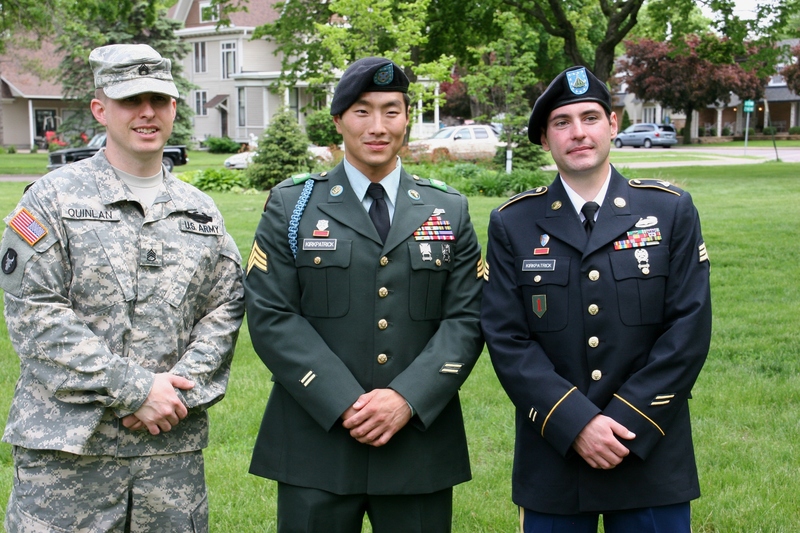 Honored veterans Adrian Gillen, left, and brothers Matt and David Kirkpatrick. Veteran Travis Quinlan watches the program at the park with hundreds of others. He was also a classmate of my eldest daughter. Hundreds gathered in Central Park for the program, presented on the bandshell. The Girl Scouts participated with a presentation on flag folding and more. 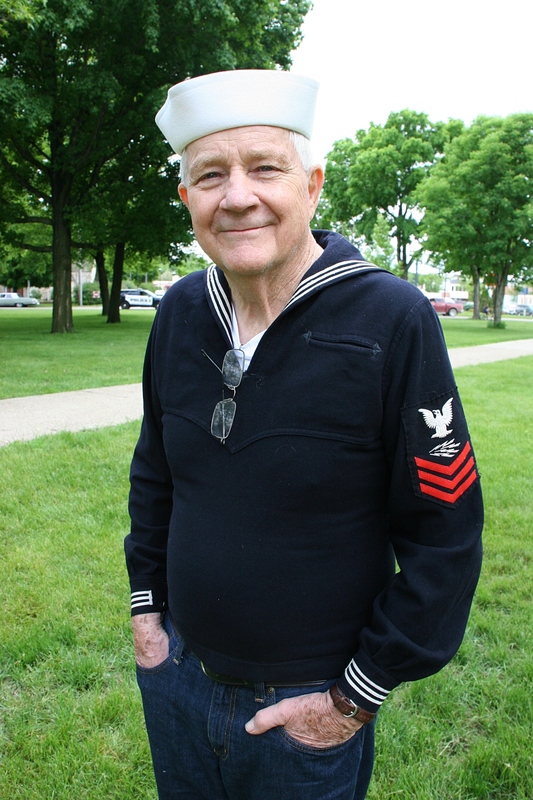 Archie Temple walked in the parade and then arrived at the park for the Memorial Day program. He served in the U.S. Navy from 1952-1956, during the time of the Korean War. That’s his original Navy uniform. Honored combat veteran Matt Kirkpatrick addresses the crowd. Grand marshals Jean and Adrian Gillen are seated next to the podium. 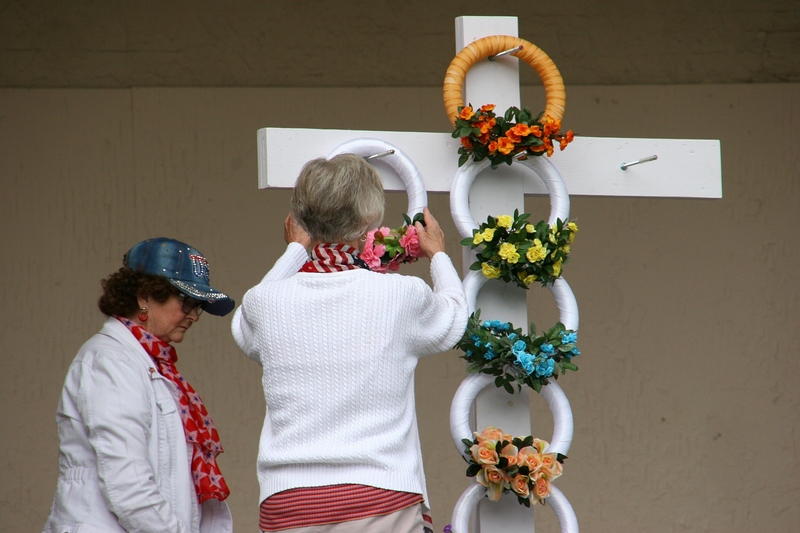 As is tradition each year, members of American Legion Auxiliary Unit 43 place wreaths on the memorial cross. The Honor Guard/Color Guard is an important part of the day’s events. As they left the park, veterans Travis Quinlan, left, and David and Matt Kirkpatrick posed for one last photo. Travis and David were Faribault High School classmates. 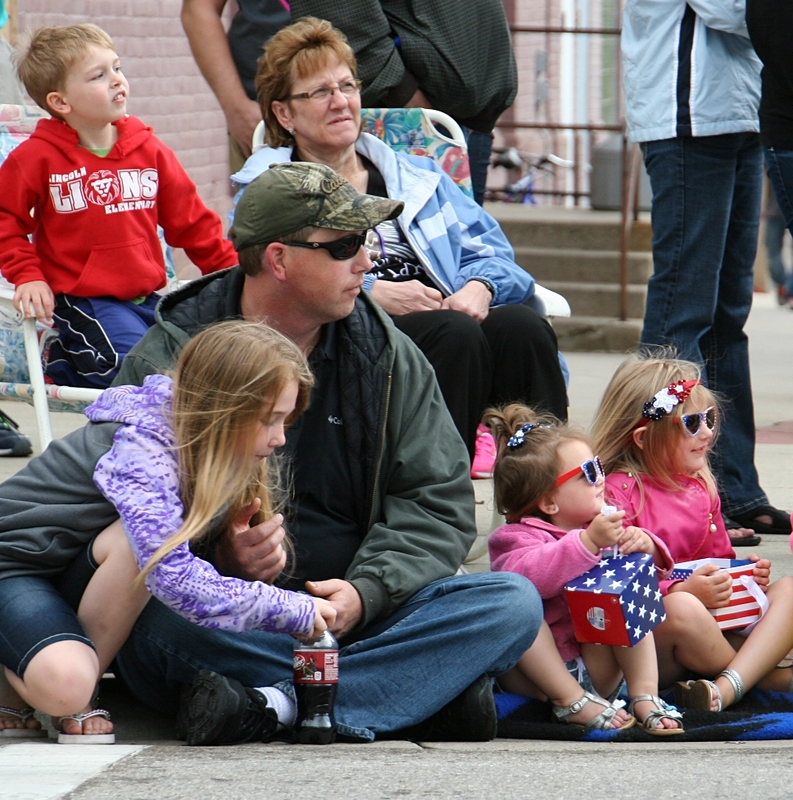 Downtown Waseca, Minnesota, on Memorial Day weekend. 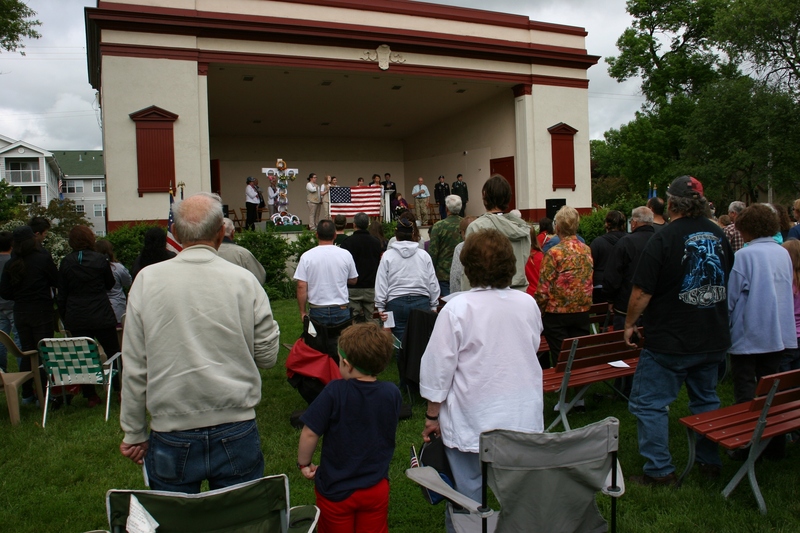 MEMORIAL DAY BRINGS a focused gratefulness for freedom. 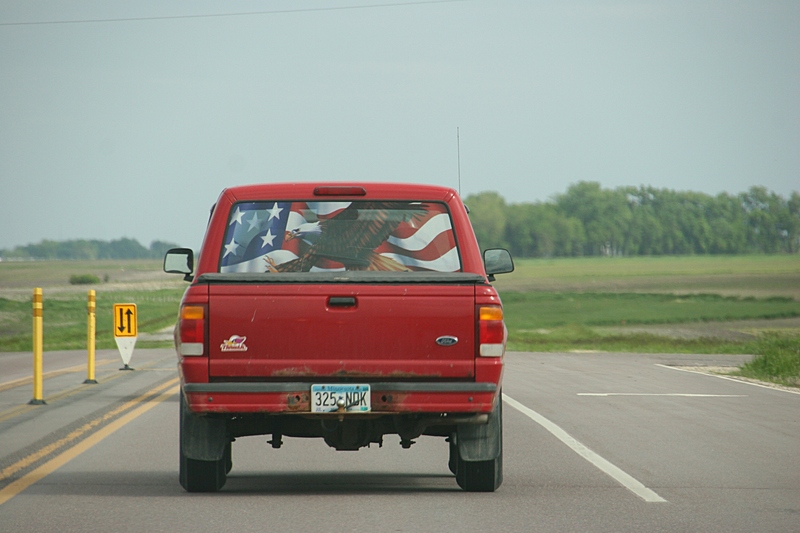 And nothing is more visually representative of freedom in the U.S. than the American flag. 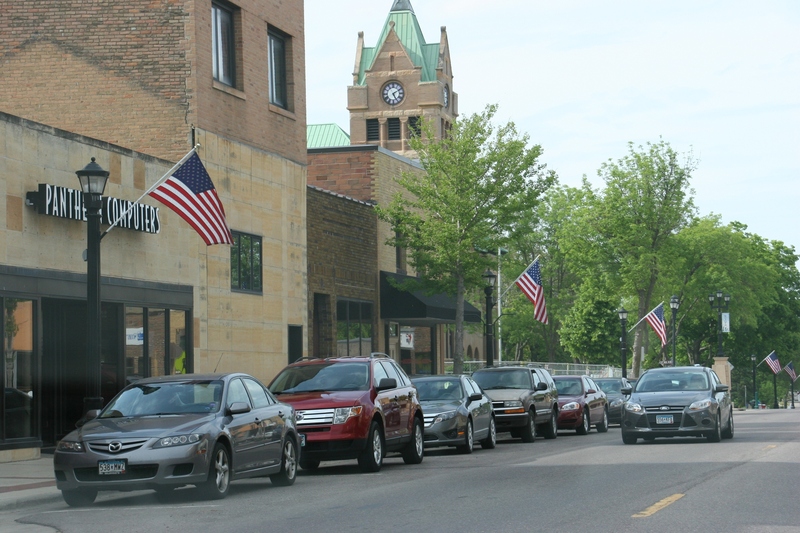 Another scene from downtown Waseca, on the other side of the street. This weekend those flags are flying seemingly everywhere. On front porches, from flag poles and from lamp posts. Driving eastbound on U.S. Highway 14 between Nicollet and Mankato. 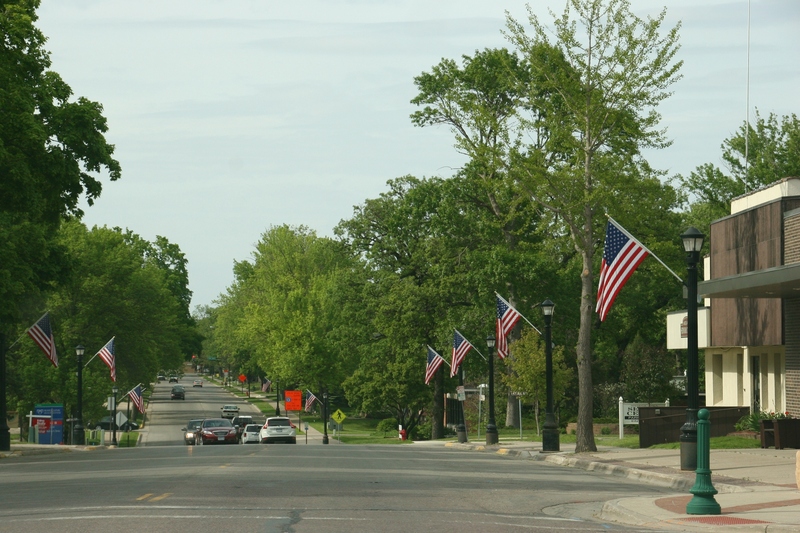 I feel my national pride swell at the sight of flags flying in communities like Elysian, Waseca and Morristown. 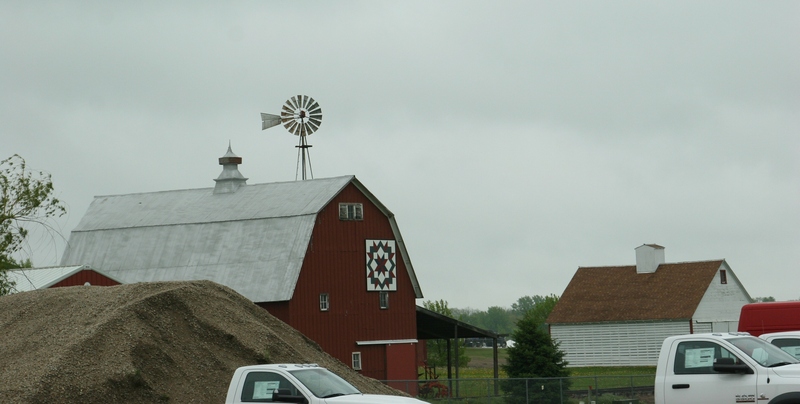 On a Saturday trip from Faribault to Belview and back, I noticed the red-white-and-blue adorning homes, businesses, pick-up trucks and even silos. Just outside of Morristown, a couple grilled on their deck, an American flag waving in the wind just inches away. 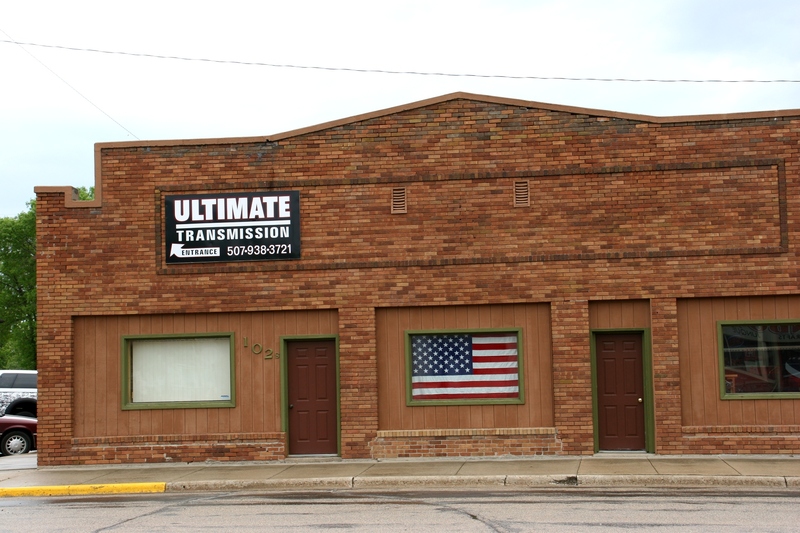 A business in downtown Belview, Minnesota. I am thankful to live in this country. And grateful to those men and women who died for freedom. Because of them, I am free to express myself through writing and photography. Free. 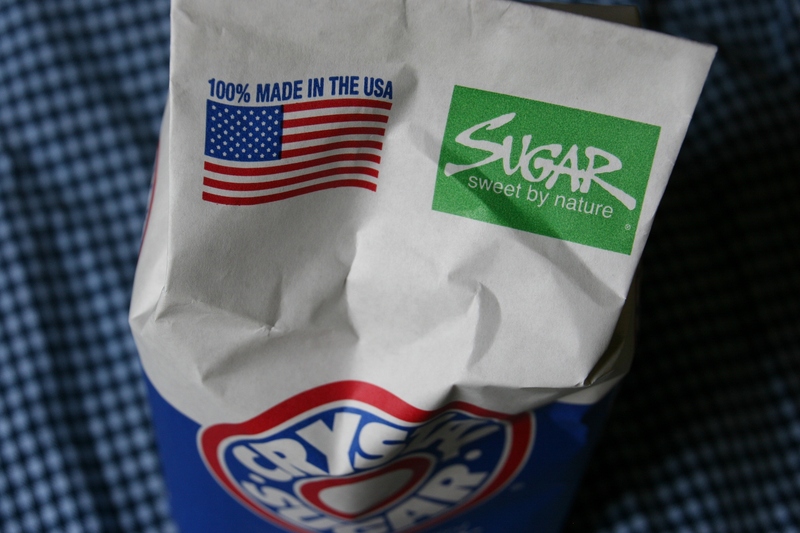 The American flag on a bag of Crystal Sugar. 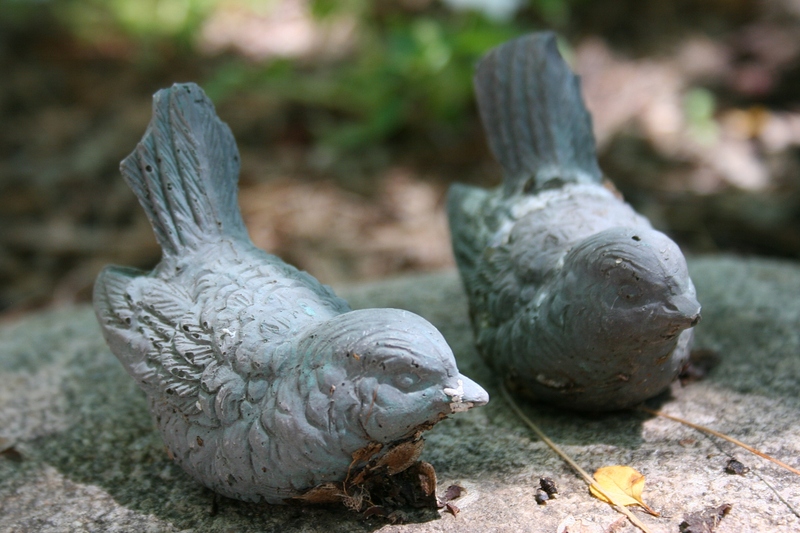 Bird art perched on a front yard rock in a Northfield, MN., garden. Minnesota Prairie Roots file photo. Be free. Be that bird out of the cage. FYI: If you are in an abusive relationship, seek help. Call your local domestic abuse hotline or the National Domestic Violence hotline at 1-800-799-7233. If you are in immediate danger, call 911. Have a safe plan to leave your abuser. You deserve to be free of physical, emotional, mental and verbal abuse, control and manipulation. Howard Homeier in his cherished early 1950s Chevy pick-up truck. Minnesota Prairie Roots file photo 2009. When I met World War II veteran Howard Homeier of Kenyon, in Kenyon, in August 2009, he’d just come from Kenyon Veterans Memorial Park. 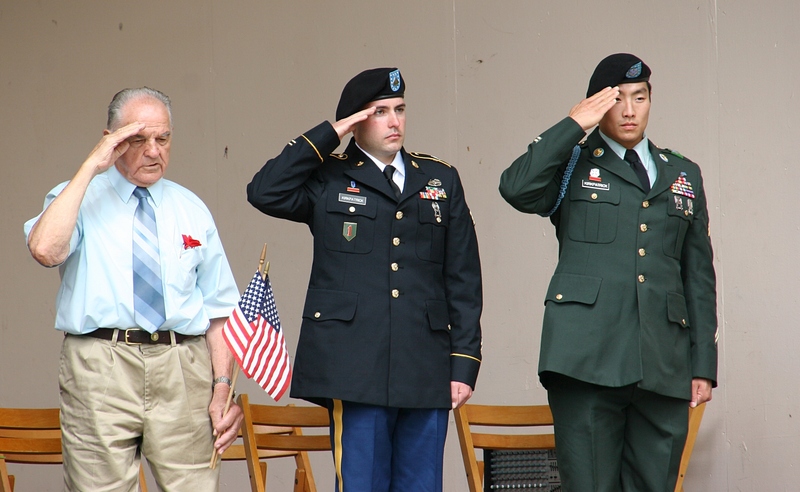 There, with other members of the Kenyon Veterans Color Guard, he’d participated in a ceremony during this southern Minnesota community’s annual Rose Fest. Howard and I chatted briefly about his service with the U.S. Army in the China Burma India Theater. 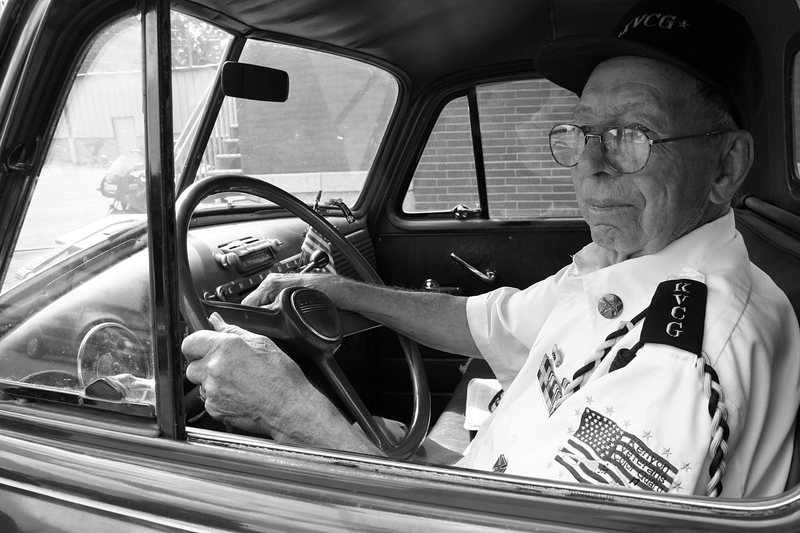 Then I admired his vintage 50s truck, with Howard allowing me to photograph it and him in it. What I mostly admired, though, was Howard’s patriotism and support of veterans. Although I didn’t ask, I’m certain he does not take freedom for granted. He understands its cost. 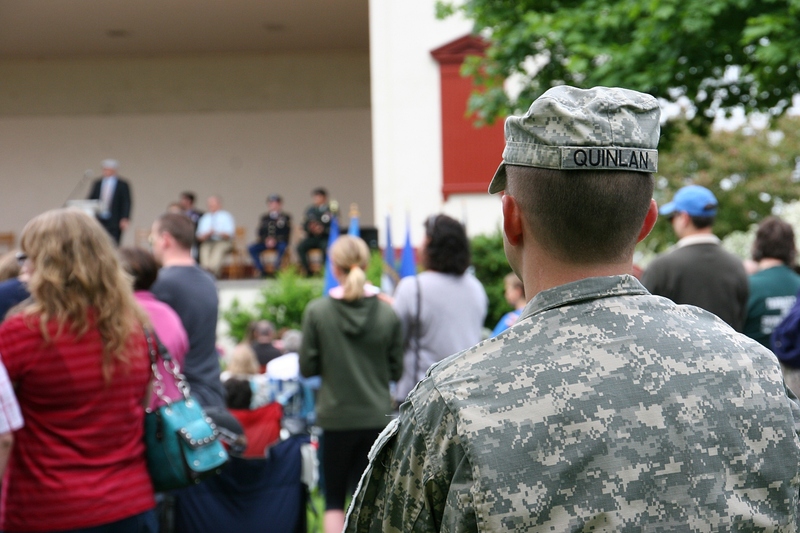 This vet put his freedom into practice by serving in Kenyon city government. Nearly six years after meeting Howard, I still remember him. I hope you, too, this weekend remember and honor a veteran.